Arkansas State Highway and Transportation Department (AHTD) found a way to solve an ongoing congestion and public safety problem in the City of Prescott, all while completing the project under budget. For years, AHTD had been looking for a way to deal with the increasing congestion and constant concern for public safety due to busy Union Pacific Railroad traffic. On any given day, roughly 35-45 trains passed over the tracks crossing Highway 371, a primary route for those in Prescott. Those drivers traveling Highway 371 found themselves stopped waiting for trains often, causing delays and backups. AHTD was increasingly concerned about vehicle/train collisions. The rail traffic and lack of an alternative route also posed a public safety issues, as emergency responders were also often held up at the tracks. In order to alleviate all of these issues, AHTD explored multiple options and eventually settled on the idea to construct a railroad overpass for traffic. This option was most attractive due to its relatively low cost, the proximity it would have to downtown Prescott, and the thought that it would require a shorter amount of roadway than other options. 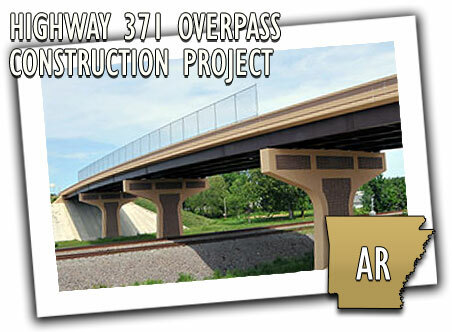 In early 2009, AHTD and its contractor began the project, which was projected to cost $6.44 million. The work included the construction of a bridge overpass of the Union Pacific Railroad main line and Highway 67, utilizing a half mile of new alignment of Highway 371. The project was completed in November 2011, costing about $6.2 million (about $200,000 under budget). Drivers in the area are no longer subject to long delays on their way to work and emergency vehicles can now get to those in need much quickly than before. "From conception of this project, it was a combined effort of local, state, federal agencies, and elected officials to achieve one common goal," said Howard Taylor, former mayor of the City of Prescott. "Having worked on many projects throughout my career, this project was unique in the fact that all agencies and organizations were truly committed and willing to compromise in order to achieve the end result of this railroad overpass for the City of Prescott."